Turkish coffee (Turkish: Türk kahvesi) is coffee prepared using very finely ground coffee beans, unfiltered. The same method is used in many Middle Eastern and Southeastern European countries. Turkish coffee refers to a method of brewing very finely ground coffee. Any coffee bean may be used; arabica varieties are considered best, but robusta or a blend is also used. The beans must be ground to a very fine powder, which is left in the coffee when served. The coffee may be ground at home in a manual grinder made for the very fine grind (home electric grinders are not suitable), ground to order by coffee merchants in most parts of the world, or bought ready-ground from many shops. Turkish coffee is made by bringing the powdered coffee with water and usually sugar to the boil in a special pot called cezve in Turkey, and often called ibrik elsewhere. As soon as the mixture begins to froth, and before it boils over, it is taken off the heat; it may be briefly reheated twice more to increase the desired froth. Sometimes about one-third of the coffee is distributed to individual cups; the remaining amount is returned to the fire and distributed to the cups as soon as it comes to the boil. The coffee is traditionally served in a special type of small porcelain cup called a kahve finjanı. Sugar is added to Turkish coffee while brewing, so the amount of sugar must be specified when preparing the coffee. It may be served unsweetened (Turkish: sade kahve), with little or moderate sugar (Turkish: orta şekerli), or sweet (Turkish: tatlı). Coffee is often served with something small and sweet to eat, such as Turkish delight. It is sometimes flavoured with cardamom, mastic, salep, or ambergris. A lot of the powdered coffee grounds are transferred from the "cezve" to the cup; in the cup, some settle on the bottom but much remains in suspension and is consumed with the coffee. First appearing in the Ottoman Empire, under the strictest interpretations of the Quran the strong coffee was considered a drug and its consumption was forbidden. Due to the immense popularity of the beverage, the sultan eventually lifted this prohibition. Superstition says the grounds left after drinking Turkish coffee can be used for fortune-telling. The cup is commonly turned over into the saucer to cool, and it is believed by some that the patterns of the coffee grounds can be used for a method of fortune telling known as tasseography. As well as being an everyday beverage, Turkish coffee is also a part of the traditional Turkish wedding custom. As a prologue to marriage, the bridegroom's parents (in the lack of his father, his mother and an elderly member of his family) must visit the young girl's family to ask the hand of the bride-to-be and the blessings of her parents upon the upcoming marriage. During this meeting, the bride-to-be must prepare and serve Turkish coffee to the guests. For the groom's coffee, the bride-to-be sometimes uses salt instead of sugar to gauge his character. If the bridegroom drinks his coffee without any sign of displeasure, the bride-to-be assumes that the groom is good-tempered and patient. As the groom already comes as the demanding party to the girl's house, in fact it is the boy who is passing an exam and etiquette requires him to receive with all smiles this particular present from the girl, although in some parts of the country this may be considered as a lack of desire on the part of the girl for marriage with that candidate. Turkish coffee is usually called either "Turkish coffee" in the local language, or named as the coffee of the country or region, e.g. "Greek coffee", "Arab[ic] coffee", etc. In Bosnia and Herzegovina, Turkish coffee is also called "Bosnian coffee" (Bosnian: bosanska kahva), which is made slightly differently from its Turkish counterpart. A deviation from the Turkish preparation is that when the water reaches its boiling point, a small amount is saved aside for later, usually in a coffee cup. Then, the coffee is added to the pot (džezva), and the remaining water in the cup is added to the pot. Everything is put back on the heat source to reach its boiling point again, which only takes a couple of seconds since the coffee is already very hot. Coffee drinking in Bosnia is a traditional daily custom and plays an important role during social gatherings. Typical Czech or Slovak Turkish coffee made of ground coffee beans poured with boiling water. A beverage called turecká káva or turek is very popular in the Czech Republic and Slovakia, although other forms of coffee preparation such as espresso have become more popular in the last few decades, decreasing the popularity of turek. Turek is usually no longer served in cafés, but it is prepared in pubs and kiosks, and in homes. The Czech and Slovak form of Turkish coffee is different from Turkish coffee in Turkey, the Arab world or Balkan countries, since a cezve is not used; instead the desired amount of ground coffee is poured into boiling or almost boiling water. In recent years, Turkish coffee is also made in a cezve (džezva in Czech), but "Turkish coffee" usually means the method described above. Coffee is prepared in the same way in Lithuania. In Greece, Turkish coffee was formerly referred to simply as 'Turkish' (τούρκικος). But political tensions with Turkey in the 1960s led to the political euphemism "Greek coffee" (ελληνικός καφές), which became even more popular after the Turkish invasion of Cyprus in 1974: "... Greek–Turkish relations at all levels became strained, 'Turkish coffee' became 'Greek coffee' by substitution of one Greek word for another while leaving the Arabic loan-word, for which there is no Greek equivalent, unchanged." There were even advertising campaigns promoting the name "Greek coffee" in the 1990s, which acknowledged the usage of "Turkish": "Thousands of Greeks follow the habit of calling their beloved coffee 'Turkish'." In Armenia, the coffee is also called “Armenian Coffee” or simply “Sourj”. In Armenia the beverage has become a cultural phenomena—families will open their house to visitors that want to enjoy the very special drink. Armenians will sometimes serve baklava alongside the coffee. According to The Reuben Percy Anecdotes compiled by journalist Thomas Byerley an Armenian opened a coffee shop in Europe in 1674, at a time when coffee was first becoming fashionable in the West. Though Percy described these first European coffee houses as "imperfect" establishments where liquor and cigarettes were still consumed, he notes that it was an "error of the Armenian" that led to the establishment of a coffeehouse in Paris called Le Procope which introduced what Percy calls "ices". 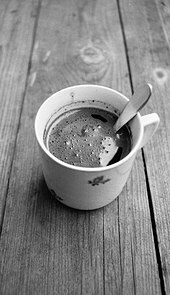 In Serbia and Montenegro, it is called "Turkish coffee" (турска кафа / turska kafa), "domestic coffee" (домаћа кафа / domaća kafa) or simply "coffee" (кафа / kafa). It is nearly identical to the Turkish version. In Iran, Turkish coffee is very popular and is known as "qahve Tork", which is usually made in North Western Iran. ^ Nisan Agca (22 November 2017). "Making Turkish Coffee with a Turkish Barista Champion". =Resources.urnex.com. Retrieved 5 May 2018. Some supermarkets sell coffee that is pre-ground, marketed as Turkish coffee, and usually robusta. ^ a b Freeman, James; Freeman, Caitlin; Duggan, Tara (2012-10-09). The Blue Bottle Craft of Coffee: Growing, Roasting, and Drinking, With Recipes. Ten Speed Press. ISBN 978-1-60774-118-3. ^ a b c Basan, Ghillie. The Middle Eastern Kitchen. New York: Hippocrene Books. p. 37. ISBN 978-0-7818-1190-3. ^ a b Akin, Engin (2015-10-06). Essential Turkish Cuisine. Abrams. ISBN 978-1-61312-871-8. ^ Inc, Fodor's Travel Publications; Hattam, Jennifer; Larson, Vanessa; Newman, Scott (2012). Turkey. Fodor's Travel Publications. ISBN 978-0-307-92843-6. ^ Basan, Ghillie. Classic Turkish Cookery. I.B. Tauris. p. 218. ISBN 1860640117. ^ Sejal Sukhadwala. "Where To Drink Coffees From Around The World In London". Londonist. Retrieved 26 October 2018. 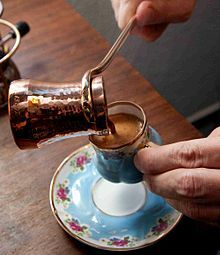 ^ "The starting point of Turkish coffee: Istanbul's historic coffeehouses". The Istanbul Guide. Retrieved 26 October 2018. ^ Gannon, Martin J. (2004). Understanding Global Cultures: Metaphorical Journeys Through 28 Nations, Clusters of Nations, and Continents. SAGE. ISBN 978-0-7619-2980-2. ^ Nissenbaum, Dion (20 July 2007). "Coffee grounds brewed trouble for Israeli fortuneteller". McClatchyDC. Retrieved 27 November 2014. ^ KÖSE, Nerin (nd). KULA OÜGÜN GELENEKLERi. Ege University. ^ "Arabic coffee, a symbol of generosity". UNESCO. Retrieved 24 November 2018. ^ Cohen, Brad (2014-07-16). "The complicated culture of Bosnian coffee". BBC - Travel: Food & Drink. Retrieved 2014-07-24. ^ LAZAROVÁ Daniela, Czech baristas compete in the art of coffee-making, Radio Prague, May 12, 2011. ^ TV3.lt, Lietuviška kava griauna mitus: lenkia italus, vejasi pasaulio geriausius, retrieved February 16, 2018. ^ Browning, Robert (1983). Medieval and Modern Greek. p. 16. ISBN 0-521-29978-0. ^ Leonidas Karakatsanis, Turkish-Greek Relations: Rapprochement, Civil Society and the Politics of Friendship, Routledge, 2014, ISBN 0415730457, p. 111 and footnote 26: "The eradication of symbolic relations with the 'Turk' was another sign of this reactivation: the success of an initiative to abolish the word 'Turkish' in one of the most widely consumed drinks in Greece, i.e. 'Turkish coffee', is indicative. In the aftermath of the Turkish intervention in Cyprus, the Greek coffee company Bravo introduced a widespread advertising campaign titled 'We Call It Greek' (Emeis ton leme Elliniko), which succeeded in shifting the relatively neutral 'name' of a product, used in the vernacular for more than a century, into a reactivated symbol of identity. 'Turkish coffee' became 'Greek coffee' and the use of one name or the other became a source of dispute separating 'traitors' from 'patriots'." ^ Broglin, Sharon; Museum, Allen Park Historical (2007-05-09). Allen Park. Arcadia Publishing. ISBN 978-1-4396-1884-4. ^ Percy, Reuben; Percy, Sholto (1823). The Percy Anecdotes: Conviviality. T. Boys. Wikimedia Commons has media related to Turkish coffee. This page was last edited on 24 March 2019, at 04:34 (UTC).